Call logging is the process of collecting phone call data, analysing this data, and then reporting on the telephone network’s cost, performance, capacity and quality of service (QoS). It should not be confused with telephone tapping or call recording. The former refers to listening to calls, while the latter is about recording conversations. Data is collected from a PBX and is referred to as CDR data (Call Detail Record). Almost all PBXs provide a way to output CDR data. On older, traditional PBXs, this is usually through a serial port. On newer models, an Ethernet connection is normally used. The CDRs are delivered via the appropriate method to a PC running the call logger software. Some PBX manufacturers provide their own basic call logging software but there are many other third party software packages available. 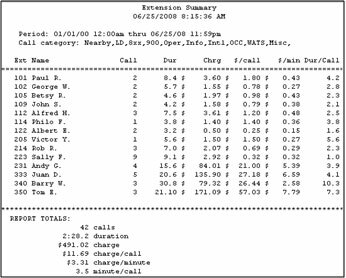 The job of the call logging software is to interpret the raw CDR data and allow the user to produce graphical reports. Call logging software packages differ in the sizes of PBX systems that they can support (from hundreds of extensions to hundreds of thousands of extensions). They also differ in reporting capability and support for specialised PBX features. Cost Control – cost of calls, cost of trunk lines, costs by department or individual extension, number of unused extensions, etc. Call logging software can also discover instances of Telephone fraud. QoS Reporting – modern VoIP PBXs are able to output quality of service data in addition to standard CDRs. An up to date call logging package should be able to include this data along with its other reports to help monitor and improve system performance. Learn more about TEL’s call logging software and call logging systems.